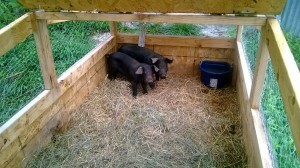 Just to introduce the LARGE BLACK pigs…. We haven’t named these two yet, but I’m sure that is coming soon. We haven’t had a chance to put them up on pasture yet either. That HAS to be done soon, as our new batch of laying hen chicks are coming this week. It’s funny to watch them eat, they make a snorting noise and chew with there mouths open, how rude!! Again, just 2 minutes of video, any more than that and I think it gets boring…. This entry was posted in Uncategorized on September 1, 2013 by Angel Garden Farm.